Recently I've been trying to work more in my art journal. I always find it kind of difficult to justify working in a journal when I know I 'should' be working on a painting or something of substance. But I just get so crazy jealous when I see other artists' art journals because they're sooooo amazing! Then I think to myself "HEY! I want one!!" I think I've found a way that works for me and it feels very freeing! I've created a totebag full of my art supplies and journal and just hit the road.... well the coffee shop, that is. Starbucks, Panera Bread or even some of the local cafes around town. I treat myself to breakfast or lunch first, and then spread my supplies on the table and start working away. Sometimes I get a lot of attention from other customers wanting to see what I'm working on, and other times everyone goes about their business as if I'm not there. Either way is fine with me. I enjoy talking to people about art, and I also enjoy the solitude of playing in my journal all by myself. But the best part is I no longer feel guilty. I'm doing this for ME and it feels good! I will take photos next time I'm out so you can see what's in my tote. Maybe you have some suggestions on what you take with you when you're "arting on the run." I'd love to hear about the places you journal or your favorite take-along supplies. I hope this new year finds you healthy and happy! It's been quite a while since I've posted anything so I wanted to give you a quick update on what's going on with me. I've been having a wonderful time since the New Year has begun and am involved in two new online workshops. "Life Book" by Willowing is a year-long journal workshop with many contributing artists. Willowing is such a generous and compassionate artist, so taking her workshops is always so rewarding. The other class I'm taking is "Hello Soul, Hello Business" by Kelly Rae Roberts and Beth Nicholls, which is a 10 week class in developing a truly soulful business. Last week was the first week for this workshop and it proved to be in-depth and very enlightening. Both workshops are already so much more than I had hoped for and expected and I'm learning so much about myself, my art, and my business. 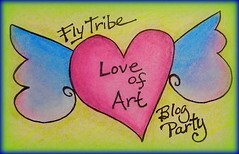 I will also be taking "Bloom True" a workshop with the amazing Flora Bowley, which begins in a couple of weeks. Looks like my year has started off with a bang... I'm gonna be one busy bee! New work to follow soon!